Can the Sensor V Attract Your Perfect Mate? I first met the lovely Elizabeth England, who co-founded Ocean-Nation and runs a cool homeopathic company called Longevity Pure Medicine, in 2011. I spotted her in the crowd when she was attending one of my DreamShield planetary meditations wearing a silver jacket, boots and flowers in her hair. Dazzling woman. However, we were both in relationships at the time and so we stayed in touch as friends, seeing each other around LA, where we both lived at the time. Nothing serious emerged. After the successful 2012 mission to Antarctica I felt ready for new love in my life. On the boat ride back from Antarctica I asked Ohom, “Who would be an ideal mate for me?” I was imagining a happy penguin couple, two happy lovebirds. Ohom is always clear and concise with me on the big stuff. Soon as I returned to LA, I called Elizabeth and invited her for drinks at the Sportsman’s Lodge where I was staying as I’d given up the place I was staying in Malibu. Elizabeth looked radiant as always and over appetizers I blurted out the story of how the ET being, Ohom, who had guided me to Antarctica told me she and I were ideal mates for each other. Still had penguins on my mind. I kidded, “I don’t understand. 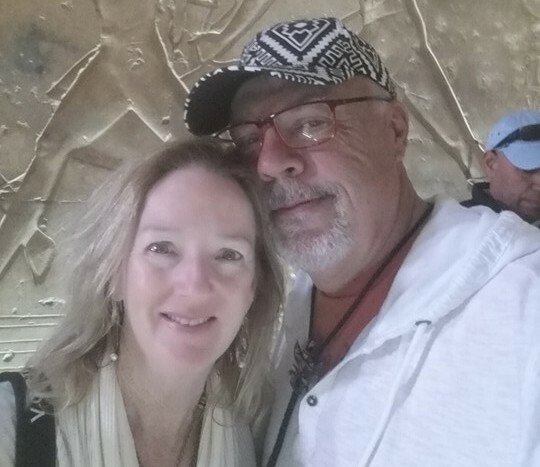 You don’t want to start life living with me in my pal’s dinning room on an air mattress?” After losing all my luggage (in a really bad taxi transaction in Chichen Itza on the way home,) I’d spent every dime I had to meditate and film in Antarctica. Ha! I was wearing fresh Goodwill clothes and I still had my film production gear, which was my livelihood. She smiled sweetly, gave me a peck on the cheek, and walked out of the restaurant. About a week later, I called scientist Patrick Flanagan and pitched him on the idea of creating 50 videos for my popular BuzzBroz YouTube channel. We had met in Chichen Itza, where I filmed him and his pal Nick Edwards for the end of the Mayan calendar event he was attending. He liked my stories of Ohom and my mastery of film and social media. Pat accepted my proposal and I was invited to Sedona to film him in early 2013. Sedona, btw, was the place Ohom–the seven foot tall, blue dragonfly-mantis-humanoid–had me go, to tune up myself for Antarctica. Now I was returning to the sacred red rocks of Sedona. Dr. Flanagan and his lovely wife Stephanie welcomed me to Sedona and gifted me a Sensor V medallion, and all their amazing Phi Sciences, one-of-a-kind, products. I studied Pat, Stephanie and their products and interviewed them about each wildly successful invention. The result was a hit YouTube series, THE FLANAGAN EXPERIMENTS. It has gathered over 25 million views. Given the doctor’s busy schedule, it took nine months(!) to film the 50 videos instead of the original three weeks plan. During this time I followed spirit and abundance powered by the Sensor V Medallion flowed into my life. I rented a house and filled it with amazing spirit art. My cup overflowed. But a happy relationship eluded me and despite my many invites, Elizabeth still had not been to visit me in Sedona. She seemed to be investing everything to get her ventures going in LA. In 2015, Elizabeth finally accepted an invitation to visit me for Thanksgiving. She’s a person of impeccable integrity and now was free to explore a relationship. And explore we have. We’ve been inseparable for 8 moon cycles now and, as Ohom predicted, we are having so much fun that we feel perfect for each other. Now, I am no stranger to financial abundance prior to the Sensor V coming into my possession. Before meeting Ohom, I had another much more ‘matrix’ life witn roles as Chicago’s #1 commercial real estate broker, $162 million skyscraper developer and builder of Oprah’s Harpo studios. I’ve been a filmmaker for myself for the last 20 years. But my incredible spirit awakening, fueled by ET energies in Italy in 2010, had left me dazed and confused and lacking in my grounding ability to draw in wealth. 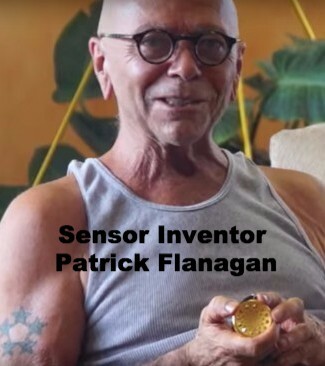 I credit Dr. Flanagan’s amazing portable abundance generator, the Sensor V, with refocusing and restoring my creative energy to attract wealth, opportunity and my perfect soulmate. Elizabeth and I are discovering connections through many past lives. In this life we had a soul contract to unite in our later years after we emerged from veiled consciousness. We both had to ‘take the red pill.’ And thanks to the Sensor V, I know we are going to be able to do great work for the Shift while enjoying an abundant lifestyle. A SECRET SENSOR V FOR YOU! If you haven’t already done so, it’s time for you, too, to get a Sensor V. Please use it wisely to draw in abundance for yourself, your loved ones, and the world. We’ve been offering the Sensor V at discounts and secret perks for many weeks now. Please understand, I cannot offer price breaks forever as these donations are to finish my film, The Coolest Meditation Ever: Antarctica 12.12.12. My goal is to help humanity connect to their innate quantum power source through film–so every dollar counts. Click on this $55 savings link now before it goes inactive a short while after the 4th of July, or you’ll need to pay a full retail of $633 afterwards. And who knows how long after the 4th I’ll be allowed to offer the rare, 24 carat, gold-plated Sensor V? This SECRET SENSOR V link will take you to the DO PENGUINS MEDITATE Indiegogo page to make a tax-deductible donation and receive your medallion. Now over $50,000 in donations thanks to many of you, the film project is nearing a stretch goal of $60K to take the film score and audio to the highest level of sound possible. Look top of the right column of prizes and you’ll find the SECRET SENSOR V link. Copyright © 2016 BuzzBroz.com, All rights reserved. Hey does anyone know how much the sensor v pendent ways?